To provide the public at large with a rigorous up-to-date view of the figure of the physician and religious reformer Arnau de Vilanova (Arnold of Villanova, Arnaldus de Villanova), in contrast to the distorted perception that is still all too common today. As the project takes off, to gradually allow the public at large and especially researchers access to the database that our team is developing on the manuscripts, modern printed documents, other documents and secondary literature referring to Arnau de Vilanova and to the corpus of medical, spiritual and alchemistic texts that circulated under his name. To share any new developments in the research on Arnau de Vilanova. To offer public information on our project, including the research, activities or publications related to it. 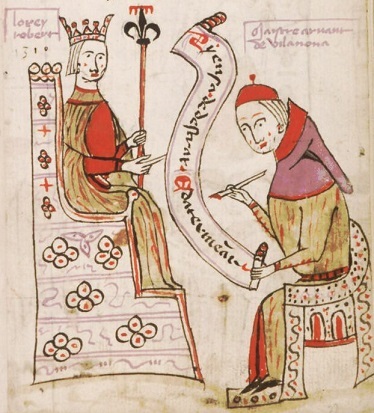 Illustration: King Robert of Naples dictates Bertran Boisset’s agronomy treatise to Arnau de Vilanova, Carpentras, Bibliotèque municipal, ms. 327, f. 23r. Source: Portet, Pierre, Bertrand Boysset (Arles, 1355-1415): la vie et les oeuvres techniques d'un arpenteur médiéval.